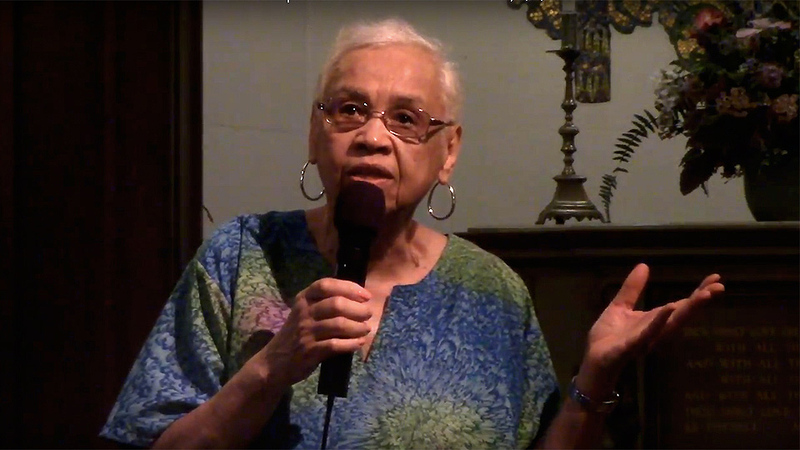 PHILADELPHIA—Rosita Johnson is a retired teacher and union activist in Philadelphia. She had a long and distinguished career teaching elementary school and serving as the elected union representative in her public school. But as busy as her job and union activity kept her, she also found time to lead another critically important struggle with an international focus. She organized and chaired the Friends of SOMAFCO, a group that for many years provided crucial support in the form of books and materials to a school for young people forced into exile from their homeland in apartheid South Africa. It was her tireless years-long leadership in organizing support for the struggling youth of South Africa that earned her the Award of the Order of O.R. Tambo in Bronze in 2018. Oliver Tambo, who passed away in 1993, is remembered as one of the giants of the South African freedom struggle. The government of South Africa recognizes a select number of people with this award each year; Rosita is one of the few non-South Africans ever to receive it. The Solomon Mahlangu Freedom College, or SOMAFCO, was in Tanzania, but its students were from South Africa, having fled their country’s apartheid terror after the 1976 Soweto uprising. With encouragement from Godfrey Sithole, the representative of the African National Congress (ANC) in the Philadelphia area, Rosita saw a need and went into action. 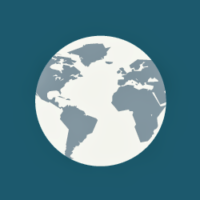 The Friends of SOMAFCO was founded in June 1987 and soon had a hard-core committee of eight activists who undertook the group’s first project. By January 1989, they had collected a stunning 14 tons of books, school supplies, and clothing which was then shipped to SOMAFCO. But that proved to be only the beginning. In subsequent years, the Friends sponsored a teacher from the school, Keith Pase, who attended the University of Pennsylvania and earned a master’s degree. They raised funds for the ANC voter education project. When SOMAFCO closed in 1992, the Friends donated funds to help the students, staff, and families return to South Africa. 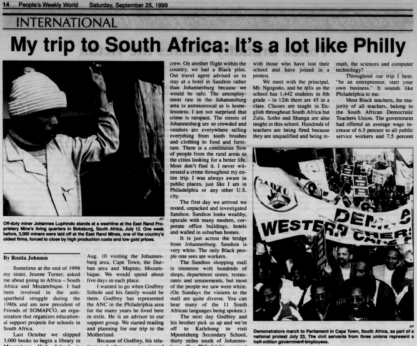 In February 1993, Rosita and two other Philadelphians traveled to South Africa to attend the ANC International Solidarity Conference where they heard both Oliver Tambo and Nelson Mandela call for international support for free elections in the country. Back in the U.S., the Friends of SOMAFCO did not close up shop; they saw more work to be done. 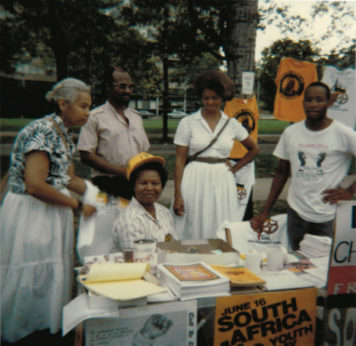 Later that same year, members of the group served on the “Welcome Mandela Committee,” which organized the well-attended rally where Mandela spoke at the Philadelphia Convention Center on July 4. 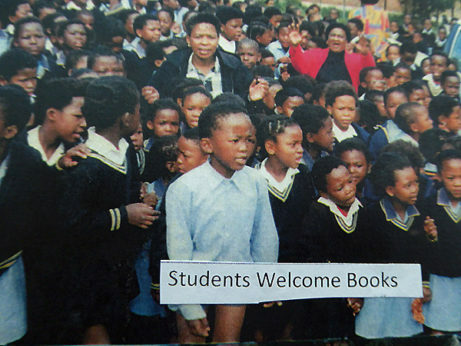 During the 1990s, the group adopted a secondary school near Soweto and, over a nine-year period, shipped thousands of books as well as equipment for a science laboratory. In 1999, Rosita and her sister, Jeanne Turner, visited the secondary school, where, as it happened, the teachers were on strike. She was glad to be able to express her support for them. It was during the 1999 visit that Selealo Ramakgopa, one the of first SOMAFCO students who had by then become a prominent member of the Republic of South Africa’s diplomatic corps, took them to places that had special significance. First, they toured the parliament building where they saw that the photos of the former apartheid leaders had been removed from their prominent places and put in the basement. They also visited Robben Island, now a tourist site, formerly the infamous prison where Mandela and other ANC leaders had been held for so long. Finally, during another emotional day, they attended a session of the Truth and Reconciliation Commission in Durban. The day they attended, they heard five former police officials confess to some of the deeds they had carried out as agents of the apartheid regime. Rosita remembers the intense emotions in the room as the police officers, who had come voluntarily in the hope of receiving lighter punishment, confessed to awful deeds, but according to some in the audience, not everything they had done. After her 1999 trip, Rosita wrote a comprehensive report which was serialized in a three-part series in the print edition of what was then the People’s Weekly World. In that report, she frankly told about the great efforts the people were making to bring change and move the country forward as well as the enormous problems South Africans faced after decades of the apartheid system. The work of the Friends of SOMAFCO was also recognized by the Philadelphia City Council with a citation on the 30th anniversary of the group’s founding in May 2017. Rosita credits her capacity for determined, consistent, and continuing struggle to her upbringing in Chicago and her early exposure to powerful progressive political ideas. She remembers often reading the Daily Worker both in her home and seeing it in her dentist’s office. But it was her activity in a rank and file caucus of the American Federation of Teachers that led her to the Communist Party USA. In a career spanning decades, she has distinguished herself as a powerful advocate for quality public education on two continents—in her own country and in the Republic of South Africa.